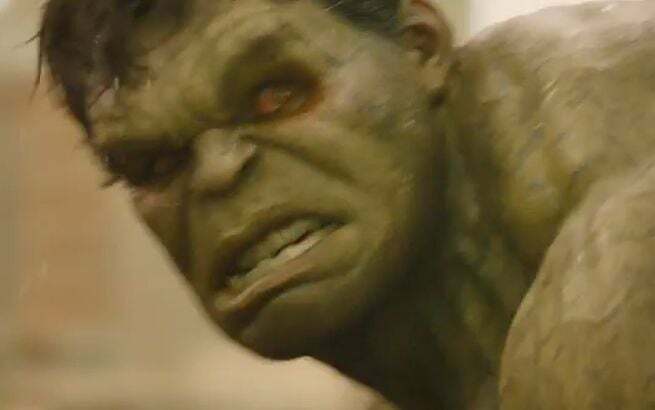 With a healthy mix of familiar footage for those who may not have seen the previous trailers yet and new footage for fanboys tuning into the NCAA Championship game just to see Hulk punch Iron Man, the second trailer for Avengers: Age of Ultron was released tonight. And boy, there were some teases. Where to start? 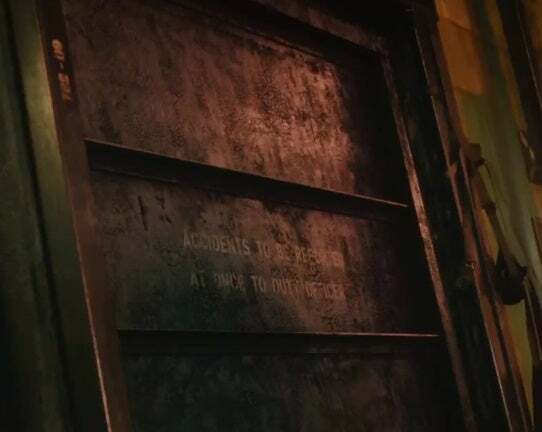 Well, this is one of those posts with a lot of speculation, a lot of screen captures and a lot of yammering, so why not start at the beginning? The trailer opens, as seen above, with Hawkeye ushering people into a waiting Avengers transport (we assume). Presumably he's trying to rescue them from something, because we see someone who looks like Wanda Maximoff fall and be left behind. 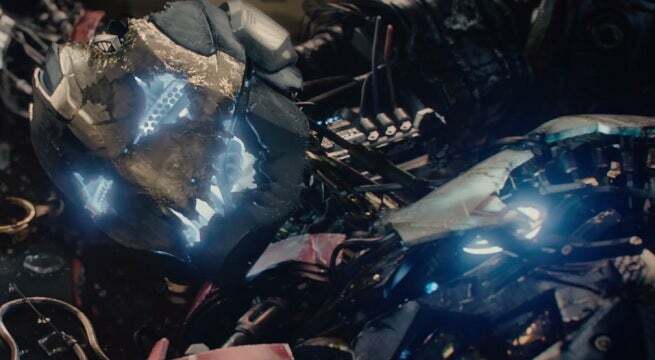 Could this be why Wanda and Pietro are easy pickings for Ultron at the start of their adventure? Doesn't seem outside of the realm of possibility. We also see that there's that same red cloud that we saw hanging over the city in the previous trailer. At the time, we speculated that it could be a T-bomb, which seems even more plausible now that Marvel's Agents of S.H.I.E.L.D. has proven officially that we won't have to wait for The Inhumans to meet some Inhumans. Whatever it is, they're clearly running from it. When Tony says that the world "needs something more powerful than any of us," it seems to be a rejection of the idea of the heroes, but it sounds like the kind of line that's just itching to be parroted back later as an inspirational line about the power of the team being greater than the sum of its parts. 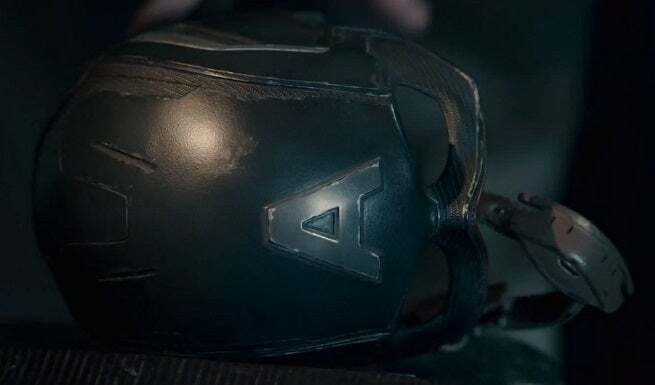 Also, we get the close-up on the Cap mask when that happens, reminding us that Cap is, above all, a symbol. It's a bit like the repeated uses of the superheroes' logos in Identity Crisis...assuming I'm not reading too much into it. In the meantime, though, somber looks all around, and Hawkeye apparently either fleeing a burning building or making it burn. It's hard to tell exactly, but whatever's going on he doesn't want to be seen. There's a possibility here that he could have set off some kind of explosive meant to subdue the Hulk. These look like the same woods that Banner was seen crawling around in during the previous trailer and, of course, both trailers show a Hulk clearly out of control. 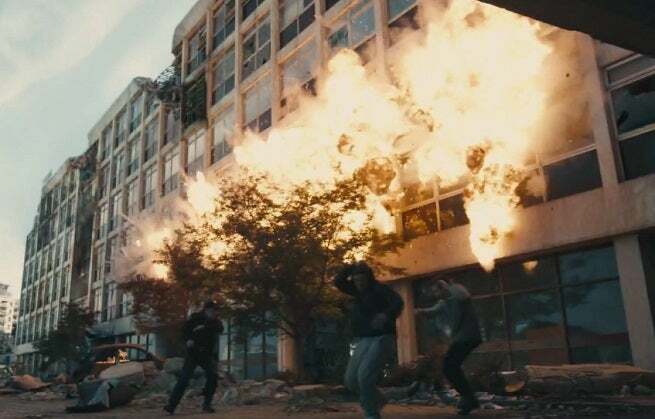 Then we get the defining moment of the trailer, as Tony surveys what appears to be a building badly damaged in a battle and Ultron says that we always create what we dread. This is a none-too-subtle hint to anyone who hasn't been following the coverage religiously that it's Tony's fault Ultron comes into being, of course. In case you couldn't pick that up from the mangled, Iron Man-looking thing that comes stumbling around later. When he comes stumbling in to menace the group with his robot minions at their party, we see that, yeah, it certainly does look like Banner and Widow are a couple, based on nothing at alll except proximity and blocking. They just look like the filmmaker wants you to assume "together." It's interesting that by that point, they already know he's called "Ultron." I kind of figured he'd get a name after he got his "real" body, but I suppose it makes sense that if he's blown all to hell like that the fight would have lasted longer than just the time it takes for him to decide what to call himself. There's a lot of brooding stares in this trailer, too. 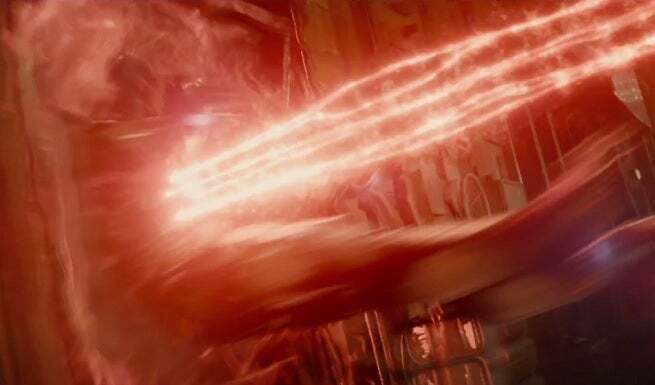 After the one Cap had earlier, Quicksilver and Scarlet Witch share one in what looks like the big stone building where they stood with Ultron in the first trailer, followed by Banner glaring at the camera as he's turning into Hulk. In between, we get a decidedly analog bombing. Is this an Ultron thing, or is tied to the Black Panther characters we see popping up more throughout the trailer this time around? More of Nick Fury's "trust no one" philosophizing pretty much just serves to remind us that he's there, and still looking significantly unofficial. Then we get a quick shot of the mystery woman who is almost certainly a member of the Dora Milaje. Thor tells Tony that he's "meddled with something you don't understand," presumably in creating life, which is something gods are ostensibly better at than the rest of us. It looks like that's a direct lead-in to the later scene (seen in the first trailer) where he hoists Stark up by the neck. "Accidents to be reported at once to duty officer." From there, we get a touch of insight on Widow...presumably her past, but it could just as easily be a misdirect. A mysterious woman grabs what looks like either a younger Natasha or a doppelganger and holds her down to that operating table from the first trailer, injecting her with something. Is this happening in the present or the past? Is it actually Natasha, or are we going to find out there's some genetic experimentation going on or something really crazy? We're guessing it's just a flashback, but...who knows. Any guesses on who that woman is holding her down by her face? We don't have one. 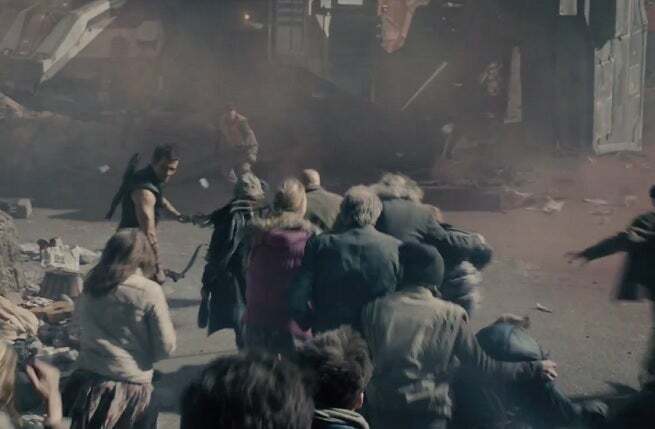 What follows is a rapid-fire sequence in which Ultron's drones, local police, Hulk and Iron Man all appear to be engaged in a big battle in the streets. 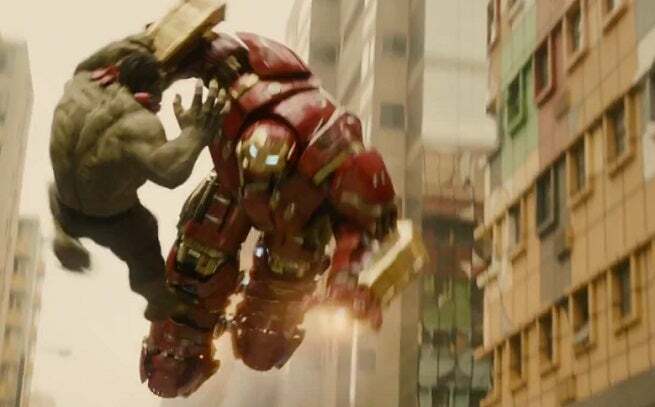 We saw much of this in the previous trailer, although we did get to see more of the Hulkbuster at work here, including flying and dragging Hulk around like he's a ragdoll or Loki. 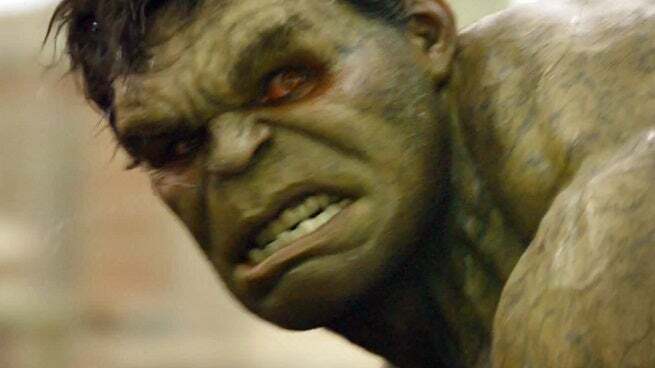 Also seen: a shot of Hulk with really, really bloodshot (or something else) eyes. This lends credence to the idea that his fury is being manipulated by Scarlet Witch, whose red energy is all over this trailer. That's a theory that was made fairly plain in the previous trailer but still hasn't been said outright. We see him kicking cars around, fighting Hulkbuster, etc., intercut with what looks like Black Widow being stalked by somebody who looks like herself, with two big, honkin' guns with light-up chambers on them. 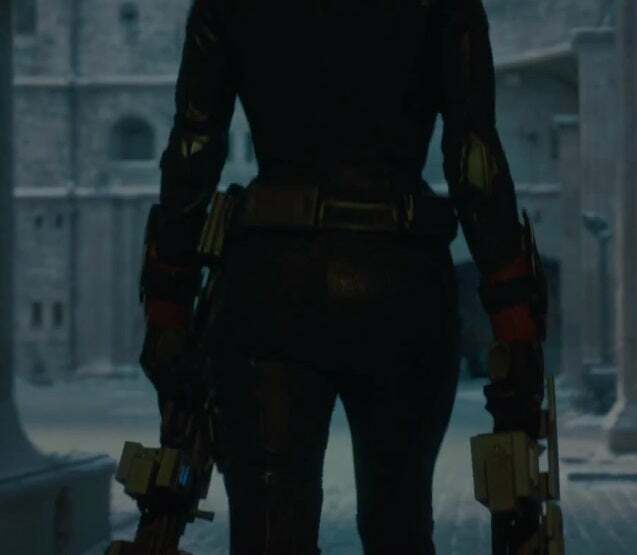 If you look closely at the image above, it looks like the Other Widow has either armored or just plain robot arms under the torn bits of cloth around her elbows. 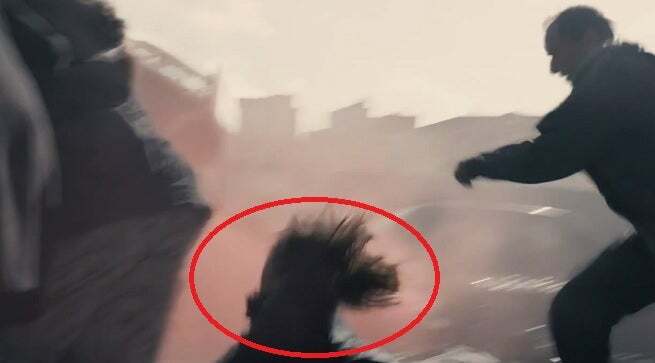 We then get a quick look at a gunman, who we saw briefly in the previous trailer and still believe to be Klaw. That's followed by Cap wrestling with an Ultron android and more shots of chaos in the streets, and a revisit of the Hulk-and-widow-holding-hands moment that seems likely to be the story beat where she calms him down from his rage. 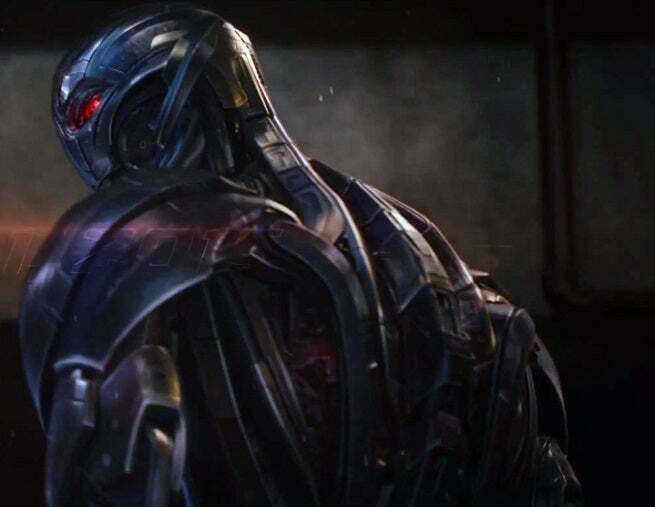 Ultron: "I'm gonna tear you apart." 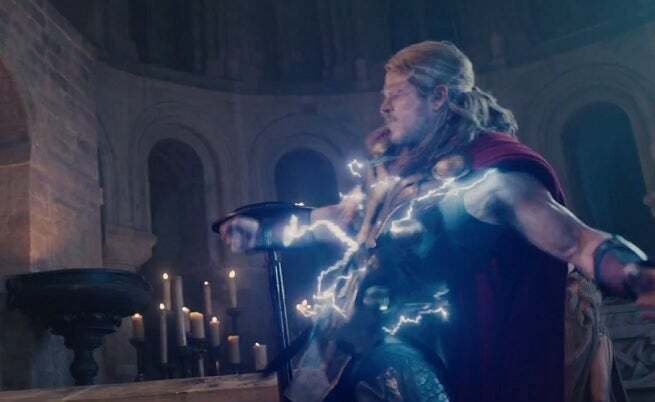 Thor is then blasted with some kind of electrical something inside of a big chamber where there's a scantily-clad woman behind him. Some folks online are saying she's Karnilla, but we don't know for sure. 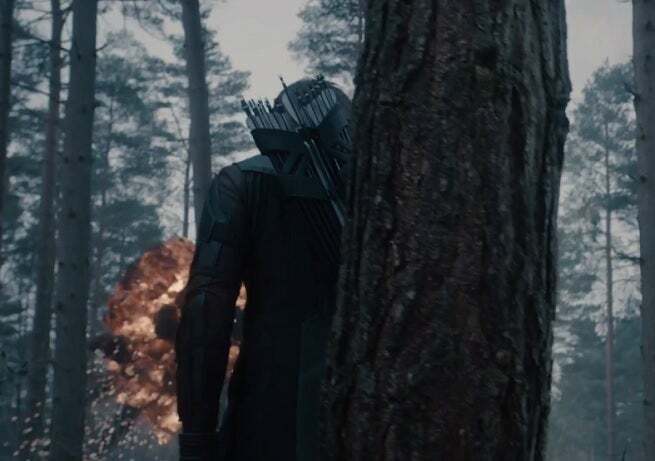 It seems likely the proximity fo the shots are meant to suggest Ultron blasted Thor, but that's clearly not the case, or at least something else happened in between if it is since the blasts are different colors.